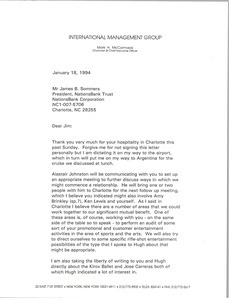 McCormack thanks Sommers for his recent hospitality to him in Charlotte, and writes that Alastair Johnston will be following up with Sommers regarding ways that NationsBank and IMG might work together. 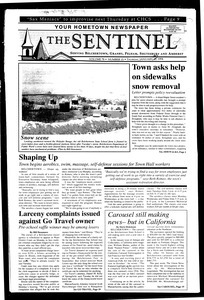 McCormack lists the Johnnie Walker Qualifying events for 1994. 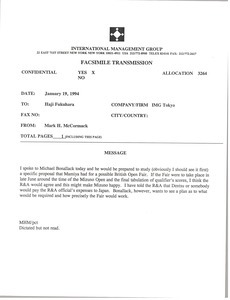 McCormack writes that Michael Bonallack would like to see a specific proposal from Mamiya for a possible British Open Fair. 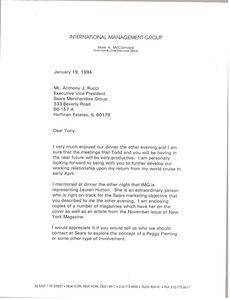 McCormack proposes an arrangement between IMG client Lauren Hutton and Sears, and will let Rucci know how the Beatles project unfolds. 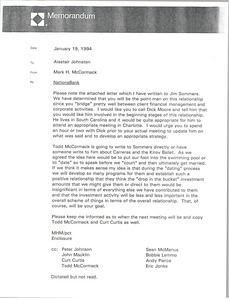 Concerning the attached letter that McCormack has written to Jim Sommers of NationsBank, and how to navigate this new business relationship. 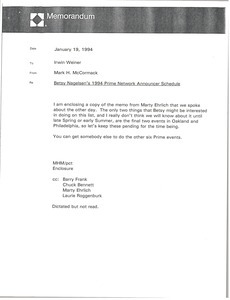 Concerning the attached 1994 announcer schedule for Betsy Nagelsen on Prime Network, McCormack writes that Betsy would only be interested in doing the last two events on this list. 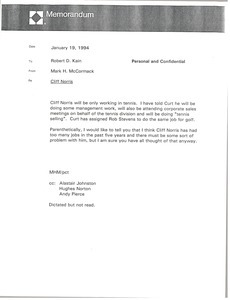 McCormack writes that Cliff Norris, apparently a perspective IMG employee, will only be working in tennis, and notes that he thinks Norris has had too many jobs in the past five years, and that there must be some sort of problem with him. 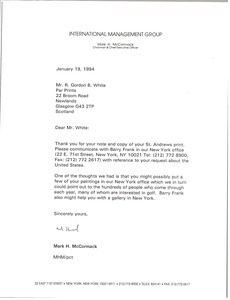 In response to White's letter, McCormack suggests White contact Barry Frank, who might be able to help White sell the prints of his paintings of golf courses in New York. 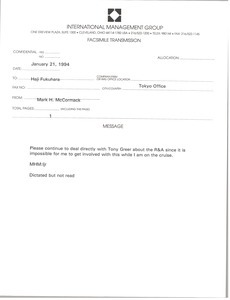 McCormack asks Fukuhara to continue to deal directly with Tony Greer about the Royal and Ancient while McCormack is on his cruise.